OUR 2019 SUMMER CAMP SCHEDULE IS AVAILABLE NOW! For a PDF of the Camp Flyer, click here: 2019 SUMMER CAMP FLYER. 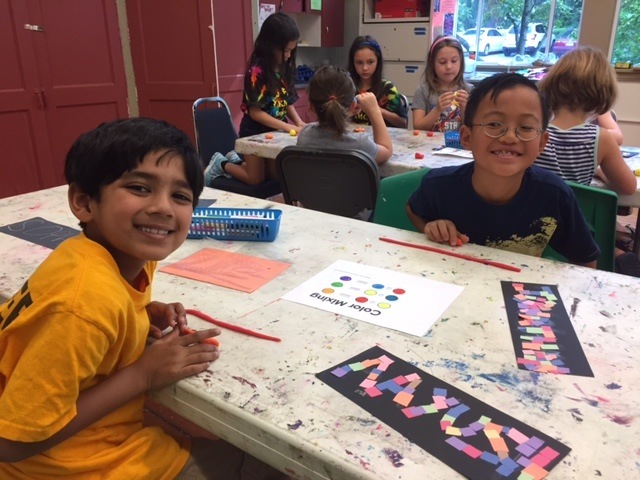 Summer Camp at Center for the Creative Arts continues its tradition of providing children an opportunity to discover their creativity in a nurturing environment that encourages self-expression. Under the guidance of professional teaching artists, campers explore a variety of mediums in the visual and performing arts while developing long lasting friendships and having fun. Our Visual and Performing Arts Camps including drawing, painting, pottery, photography, dance, theater, music and more. Each week of camp ends with our Friday Fun Finale where parents and family members are invited to join us for exhibitions and student performances. Our camps are designed for three age groups, K-2, 3-5 and 6-9. It is based on what grade your child will be entering in the fall. We offer half and full day camps as well as before and after care. Families may choose any combination of half or full days to accommodate their summer schedules. Supervised lunchtime is offered for free for those staying for both morning and afternoon camps. FULL DAY: Select one AM and one PM camp. Supervised lunchtime between AM and PM camps is 11:30am to 12:30pm and is included for free when attending morning and afternoon sessions. Campers bring their own lunch and snacks. Campers often get a small break in the middle of each camp and should bring appropriate snacks to have at this time also. Need extra care for your child before or after camp hours? CCArts has you covered! For an additional fee, you can enroll your child in extended care options for BEFORE CARE and AFTER CARE. There are options for drop-in, single day before or after care which can be purchased in the office any time as needed. Through the generous support of our local community, grants, and donations, CCArts has financial aid available to students. Summer arts campers receive full or partial scholarships based on demonstrated need. Applications for full or partial scholarships must be returned to CCArts at least one week before the start of the desired camp to allow enough time for processing. Call the center if you have special circumstances for us to consider. Download the Financial Aid Application now. Please contact CCArts for more information and application: 302.239.2434. Please understand that classes are based on meeting a minimum number of registrations in order to run. Full refunds will be made if a class is cancelled due to less than minimum enrollment. A $25 fee will be charged for any cancellation or transfer of your registration from one class to another. Refunds will only be issued for withdrawals made at least 2 weeks prior to the start of the camp. The registration fee of $20 is non-refundable. Looking for a cool way to earn community service hours for high school graduation? Join us this summer as a teen intern! Interns assist teaching artists, help supervise children and work on special projects. Have an interest in the arts and education? This will be a great experience for you! Click here for our teen internship page. Want to support our program by donating supplies? Prismacolor pencils, in colors, any size sets; 9" x 12" sketch pads, spiral bound; acrylic paints in tubes in primary and secondary colors; canvas pads; kneaded erasers; storage containers both shoebox and sweater sizes; clean cardboard; bristol board; watercolor paper in pads; canvases in any size less than 30"; Modge Podge; Sculpey clay in colors; Tie-Dye kits; used hair dryers; small table top fans; Gift Cards to local art supply stores. You can drop off supplies to our office any time we're open. We can issue you a receipt for tax purposes. All donations are tax-deductible. Build confidence and skills at planning, sketching, and selecting the best art materials, and using the right techniques to create awesome 2-D art. Create awesome posters and displays for school art projects and get your assignments aced! Campers will learn basic techniques and different ways to use acrylic paint. Blending and textures will be explained and assorted subjects will be available to paint. You can be a star in your very own TV show! Create a Game Show, Commercial, Comedy Show, and Reality Talent Show such as “The Voice” or “CCArts Got Talent”. Become a celebrity as we watch ourselves perform on the TV screen for family & campers on Friday. DVD’s can be purchased for a small fee at the end of the week and picked up the following week. Discover the power of color! Learn about the Primary, Secondary, Tertiary, and Complementary Color schemes. Discover which colors create warm, cool, and popping moods through multiple mediums. Using recycled puzzle pieces and other items, such as wire and beads, students will create unique jewelry pieces, tiaras, crowns and even wands. Every American Girl Doll has its own story. Bring your doll to camp and help develop an original play combining all the doll’s stories to be performed for family and campers on Friday. Campers will do related American Girl craft activities during the week to bring home fond memories from their fun filled week. Campers will be engaged in a collaborative art project for the beautification of CCArts’ and to teach our youth how artists will pull together and work on murals and projects, all for the benefit of making the world around them shine! Celebrate the season by making artworks for, and inspired by, your flowers and vegetable gardens. Projects include concrete stepping stones, wind chimes, decorative plant pots and more! Let’s celebrate all things that move and groove! We’ll create kites, mobiles, hot air balloons and other art that moves through a variety of really cool projects. Let’s get moving for art! Use small “pieces” of just about anything to create art. 2D and 3D art can be created using a variety of found objects. Very creative! During our Art in the Dark camp, students will learn about nocturnal animals and creatures and recreate them in art. Campers will also make collages of night scenes and experiment with glow in the dark and black light paints. No reason to be scared, the nighttime is the best time for fun! There is nothing like the great outdoors to inspire the artist in us all. Campers will explore the natural world around them and then create some very cool art projects from their explorations. Create your own books with different techniques like Japanese stab binding, sewing and gluing. Design the outside cover with beautiful handmade papers or your own creations. Take home your new, personalized diary, sketchbook or calendar book. Learn about the world of insects and create several crawly bugs or beautiful butterflies with wire, clay, beads, buttons and paper maché. Have fun exploring the vast variety of this part of the animal kingdom through art, and decorate flowerpots or your garden with your creations. Bugs are cool! Thousands of fascinating bugs and other creepy crawlies (like spiders, slugs and worms) live on our planet. In this class, explore bugs through many kinds of materials and different art methods. Make bugs that fly, hang and ooze…. see examples of bugs, slugs and other creatures from art through the ages and create your own! Projects will include diverse materials to make dragonflies, butterflies, mantises and banana slugs which will be incorporated into kites, mobiles and a buggy shadow box. The course will focus on three-dimensional design. There will be projects ranging from construction with craft sticks with a focus on making something structurally sound to creating forms with cardboard. These projects are based on construction and imagination. We will create buildings, animals and creatures and then move into abstract busts of students. Together we will explore realism, surrealism and abstraction as we move through the various ways of self-expression. Campers will dive into art projects that explore all things wet! Oceans, pools, lakes and more will be the study for creating fantastic summer art! Join the CCArts community in beautification of our garden. Create organic forms with clay using molds. We will explore and use fun textures in the studio including hunting for things to make textures with outdoors. We will stack forms to create a community garden project. Your work will be on display at CCArts for years to come! What happens when you mix glass with glazes? They burst into color!! Explore the many exciting elements of glazes. We will mix science with glaze chemistry during this camp and experiment with bisque-ware. Most projects will be ready to take home on Friday! ** A $25 material fee has been added to the cost of this camp. Create your ultimate pair of goblets using coil and hand building techniques. ** Camp has an additional $25 material fee included. Bright colors are the focus of this camp. We will draw, paint and collage using lots of fun and happy colors. Let’s learn how to “push” colored pencils beautiful soft shading by adding watercolor paints! We will explore new colorful art with paint and pigment to make your art illustrations, and projects wake up with glorious color effects! Great for all types of painting and subject choices and ALL levels of artists! We will make color studies and experiments in a workshop format. Let’s make the rich, beautiful soft shading of colored pencils POP with the power of adding wet COLOR Posca Markers as well as with watercolor paints! We will make colorful art with paint and pigment to make your illustrations and projects wake up with cool color effects. Great for all types of painting and subject choices and ALL levels of artists! We will make color studies and experiments in a workshop format and each complete a final artwork. Collage is cool and even a little bit crazy when you allow your creativity to shine. We will produce some exciting pieces of art using a variety of found objects, some paint and a whole lot of imagination! Colors can be crazy when you know which ones to pick. We will be drawing and painting while using bright and bold colors to make our pictures pop! We’ll also use color in different ways to set a mood to our works of art. Perform an actual scripted play as we learn acting techniques for the stage. 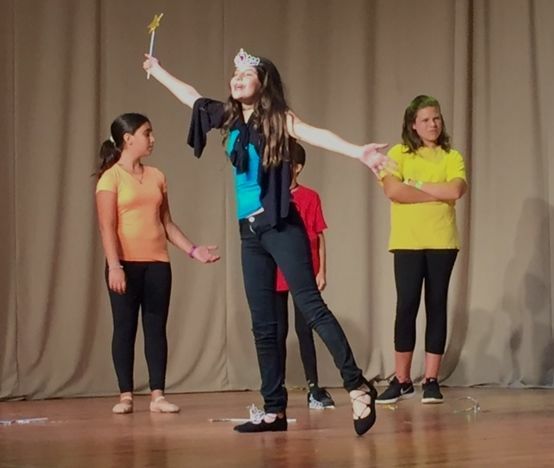 During the week we will learn acting skills such as voice projection, stage movement, how to develop a character, costuming and make-up and then perform our final scripted production for campers and family on Friday. Explore the mythology of dragons and sea serpents from around the globe and create sculptures, drawings and paintings of these fantastic creatures. Use your imagination to invent your own dragon or serpent. Dragons have been around for thousands of years, captured in the imagination and lore of cultures around the world. Some are good, some are lucky and others are scary. In this class, explore dragons from around the world to inspire you to create your own. Projects will include clay dragons, drawn ink dragons inspired by China, dramatic Japanese dragons painted on black canvas (or black velvet), fanciful Celtic dragons, and dragon puppets from fabric and felt. Stem to Steam: Science & Color. Build your understanding and interest in science through drawing, painting and art experiments! We will explore new colorful art with paint pigments to make charts and nature illustrations. This class will really help you see science as fun! Build confidence and skills at seeing, sketching and building 3-D textures of water dwelling animals and our ocean friends. We will examine the textures and colors in and on the water. We will let our imagination guide us in recreating what we see into fantastic illustrations. Drawing is an important core foundation and these fun exercises and easy strategies will give you real tools to succeed. Sketch outside, paint on canvas, explore color and how to make things look 3D using a variety of drawing and painting materials to create landscapes, animal portraits, and abstract art through a variety of mediums. Drawing is the most important core requirement of architecture, crafts, and the Fine Arts. We will practice observation techniques with fun exercises and easy strategies to learn how to draw realistic faces. Use your new skills to bring faces into your other forms of art as well as improved portrait studies. Drawing small is fun and fast. Composition as well as basic drawing will be taught. Drawings will be inked and color added to create the perfect work of art! Campers interested in developing their drawing skills will learn and utilize the grid method to draw more accurately. Students will recreate same size images as well as enlargements. Students will learn to draw and place objects for composition. Shading, blending, lifting and other techniques will be taught and students will have the ability to learn at their own speed and level. Build confidence and skills at seeing, sketching and building 3-D textures of furry animals. Bring a photo of your pet to draw if you have one. We’ll explore human hair as well as other fur-like textures around us and learn how to convey them in art. Drawing is the most important core foundation and these fun exercises will give you real tools to succeed in your art. This course will focus on the crazy and dream like art movement of surrealism. This movement focuses on the crazy and absurd style of art that our brains are still very much open to. We will concentrate on drawing and painting as we look into artists such as Salvador Dali. We will have discussions on dreams and what it means to create art that feels like you are in a dream like place. Projects will include: Food Face Portraits, Dream Landscapes, Juxtaposition Sketching and much more! Campers will use a variety of untraditional or “extra” ordinary mediums to create some really awesome projects in art! Try unusual materials such as Shrinky Dinks, Sun Prints, Twisteez colored wire and more! 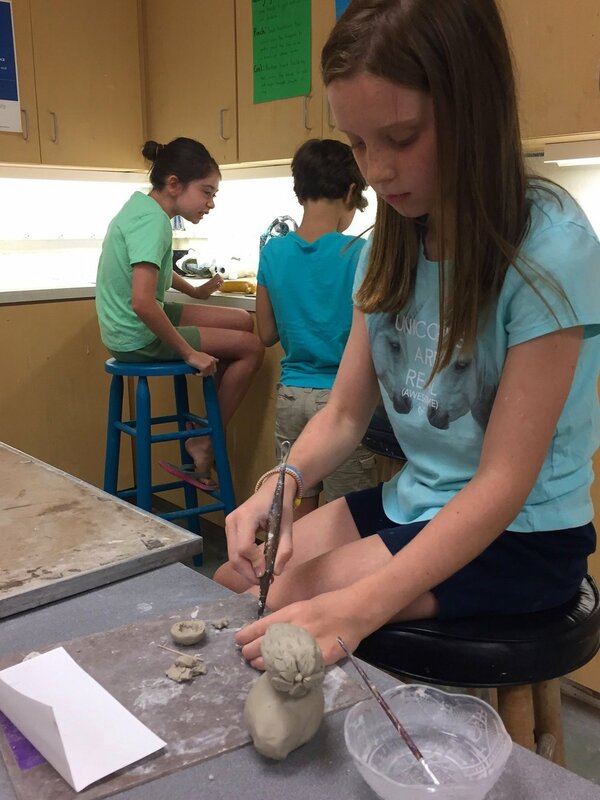 Using hand building techniques, students transform a drawing exploring fantasy creatures of their choice into a low relief clay artwork. Instructor will work with each camper one on one to help bring their idea into the world of 3D. Bring your books and drawings to class for inspiration. **Camp has an additional $25 material fee included. Campers will learn the basics of illustration for advertisement. Campers will create awesome posters designed to attract crowds for the CCArts’ performing arts camps and more! Artwork may be used on the CCArt website and Facebook posts to promote our programs. Your artwork might be published! This is a combined class of wheel throwing and hand building in clay. Create your own form on the wheel and then take it to the next level by adding handbuilt features. We'll finish it all off by painting our creations with wild metallic glazes. ***A $30 material fee has been added to the cost of this camp. Ever want to be a famous Hollywood movie actor? Well, this is your starring moment as campers work together to develop an original script, film it, co-direct, act, edit and learn what it takes to produce a movie. Filmmakers will observe their acting, camera, writing, directing and editing skills each day at the dailies and present their film at a filmfest for family and campers on Friday. DVD’s may be purchased for a small fee at the end of the week and picked up the following week. Campers will discover the most popular periods of the Modern Art movement. Along with learning the history of each period, campers will also create artwork influenced by artists of that time. Learn how to be spontaneous, funny, and create characters on the spot as campers improvise and create comedy sketches. Imagination and creativity are core as campers learn short form improvisation techniques by developing skits using different characters and premises as well as fun interactive games with the audience. Our comedy troupe will perform an interactive show for family and campers on Friday. It’s CCARTS live! Create your own project in clay from start to finish. Create small projects to be completed daily. Students will make and paint their projects daily. **Camp has an additional $25 material fee included. During this week of camp we will focus on the artists themselves…you! Through multiple projects and experimenting with many different artist’ media, little artists will have fun producing self-portraits and other expressions of themselves. Jewelry making is lots of fun! Create a variety of jewelry pieces using wire, beads, washers, cords and more! Campers will make rings and pendants by twisting and turning wire in various fun and creative shapes. Take home many pieces to wear and share with friends. Lions and tigers and bears, oh my! Have a blast creating ceramic pots based off some of your favorite animals. Create turtle-shaped boxes, pinch-pot pets, fun fish dishes, and more in this playful summer camp! **Camp has an additional $25 material fee included. Learn about the life and artistic styles of a master artist each day through fun and inviting stories and accompanying works of art. Paint, draw and collage the masters! Artists will discover various birds through a variety of fun mediums. Polymer clay birds in nests, a collage of birds in trees, create a birdhouse and feeder and much more! Birds are everywhere in the world around us. Let’s have fun with them through art! Starting with a one-of-a kind, handcrafted wooden structure, create your own, unique Fairy or Gnome house, entirely made of natural materials. Let your creativity flow as you design the outside, inside and garden of the “abode” and be ready by Friday to have the fairies move in. *Camp has an additional $15 material fee included. Fiber art is limitless. Raw wool can be used to create magical fairies, felted soaps and weavings. Make practical items like coasters and create a painting entirely out of fiber through needle felting. Be inspired by the endless options and thrilled by the end results. Design and make original games and toys! Use your imagination and new ideas to create board games, spinners and stuffed toys. Learn about the life and artistic style of a master artist each day. Paint, draw and collage in the style of famous artists while learning about the time in which they created and what made them famous. Make art that can fit in the palm of your hand. We will work with polymer clay to make miniatures as well as using Shrinky Dinks and creating tiny paintings on canvas. Campers will create art by mish-mashing cool objects together to make wild and wonderful collages of using mixed materials of all kinds! Let’s create some wacky mixed up 3D sculptures using a wide variety of media. How about a robot with wings or an animal on wheels? We will create some very cool pieces only limited by our imagination! Learn how to create and keep meaningful and beautiful summer memories of vacations, family fun, pets, camps and more by creating amazing journals! Build skills at developing multi-media illustration using printing, painting and drawing. Great for improving our story writing and illustrating skills. If you like to sing, dance, and act, this is your opportunity to star as we learn musical production numbers from Broadway and Film. Campers will develop a confident stage presence as they present an entertaining performance of show stopping numbers for family and campers on Friday. Imagine exploring the oceans and beaches of the world. The creatures and landscapes of the sea and shore, from tide pools to the darkest depths, will inspire us as we create sculptures, drawings and paintings. Draw and paint the weird and the wondrous. Campers will be prompted to dig deep into their creative brains to paint and draw art that is just plain strange. We will draw and paint mashed up creatures and very funky friends. Imagination is key to this off the wall art camp. Draw and paint the weird and the macabre. We will use our creative thoughts and ideas to paint and draw art that just doesn’t quite fit the norm. Bones, skulls and fantasy scenes will be the focus of this camp. Now that’s imagination! Freeze frame on art! Campers will spend time taking fabulous pictures on their mobile devices and then choose some of their favorites to recreate through drawing, painting and/or collage. Get in the zone creating beautiful handbuilt ceramic art to decorate your space. Make candle lanterns, cool coil pots, jewelry pieces (and dishes to put them in), self-portrait plant holders, and more! Who knew playing with mud could be so productive? **Camp has an additional $25 material fee included. Get set to draw! Students will learn the fine art of drawing portraits. Take your art to the next level and be prepared to walk away with a great foundation of portraiture knowledge and some very sophisticated works of art. Puppets are such a fun way to experience art in an abstract way. We will create finger puppets, sock puppets, Marionettes and even create a shadow puppet theatre. Too cool! Students will learn the basics of printmaking using a variety of fun and unusual objects! Printmaking allows us to make multiple works of art from the same tool or plate. We can change up the colors and arrangement of impressions each time. We can make lots or prints to keep or share. Journey with us into the world of imagination and leave with some awesome art! Hamilton is sold out on Broadway so campers will create and perform a Hamilton-like rap show on the CCARTS stage in our original rap like Hamilton production. Our talented performers will write the script, develop the characters, and learn acting techniques for the stage as they perform for family and campers on Friday. Let’s learn the basics of printmaking through a variety of off the wall, way cool art projects! Campers will try their hand at various printmaking projects and experience art in a fun new way. Awesome! Learn to perform as a musical unit. Together we will practice 2 or 3 rock, pop, and/or blues songs. Students need to have knowledge of basic cords and be able to keep time. Our band is open to many instruments including piano, bass, strings, vocals and more! Friday we treat the CCArts’ families and friends with a live performance. Rock on! Let’s get together and make a lasting art impression at CCArts. This camp is designed to get the youngest of artists involved in a group art project to help beautify and inspire. Campers will design, draw and paint garden art and finish by painting some really cool rocks for our garden and for theirs! Introduction to sculpting large animals and the human form out of clay. Campers explore anatomy using armatures and armature wire to build clay models. **Camp has an additional $25 material fee included. Love theatre, but don’t want to act? Many artists are needed to make a theatrical production come to life! Learn all the elements of theatre’s backstage craft including, props, sets, makeup and more! A triple treat as campers sing, dance, and act from favorite Broadway Musicals and Film. With so many new Musical Theatre productions as well as TV and Movie Musicals, campers will learn vocalization, choreography, and acting skills from original Broadway and Film scripts. Campers will perform selections from current and past hit shows and film for family and campers on Friday. Life under the sea is fascinating. Little artists will explore the ocean deep and create some very cool nautical theme art. Life is better, down where it’s wetter! We are inspired by the work of Damien Hirst. Explore creative spinning on the wheel. Create fun collaged works of art created on the wheel using a variety of techniques from painting into glue, painting with markers, watercolor, shaving cream, and much more all on the wheel! We will assemble all of our projects to make a collaborative mural. Mash up of Victorian design elements with nineteenth century inventions including gears, springs, sprockets and housewares to create art with a young inventor’s flair. Very imaginative! Build your understanding and interest in science through drawing, painting and art experiments! We will explore new colorful art with paint pigments to make charts and nature illustrations. This class will really help you see science as fun! Let your imagination soar as you create your own superhero and make them come to life. Choose their powers and their costume and then draw and color their story through comic illustration. Through different types of paint and through multiple projects, campers will get a feel for what types of paints are available for their very own creations of art. Artists will explore oil paints, watercolors, gouache, acrylics and more! Students will create art inspired by worldly destinations through drawing, painting and collage. Get your passports ready and let’s set sail around this big old world of ours. Destination…Art! Laugh all week as we learn to make others laugh with tried and true theatre games. Learn the art of comedy as campers develop spontaneity, creativity, stage presence, self-expression, and team work through fun theatre games. Campers will perform a live show for family and campers on Friday. The Trashy Arts classes will explore the myriad uses of materials too often headed for the landfill. Plastic bottles, tin cans, feed bags, detergent containers and the like will serve as the starting point for participants to fuel their creativity and to see beyond the intended use of those objects. So-called “trash” will be deconstructed, assembled, riveted and grommeted into artful objects rarely seen this side of the globe. Campers will have fun creating colorful artwork about Unicorns, Rainbows, and Butterflies. We will explore drawing, painting, collage and more! Build a fort was so much fun, we are now building an entire village! Campers will work together to create a village of shops and homes that they’ll design and construct by their own hands. How impressive! Learn the techniques and tricks to produce beautiful watercolor paintings. Instructor will demonstrate various techniques by introducing items such as salt, saran wrap and masking tape to create watercolor masterpieces. Learn basic techniques and tricks. Students will use objects such as saran wrap to create texture. Campers will learn how to splatter with the use of salt and by scraping. What fun! Everything Oz combines all the Oz characters in an original version of what could happen in Oz if Dorothy never made it home, the Scarecrow never got a brain, the Tin Man never got a heart, and the Cowardly Lion, well, is still cowardly. Campers will come up with an original version and by the way, who is the real Wizard? Laughs will abound all week as we create a unique play to be performed for family and campers on Friday. Learn the basics of the wheel throwing to make vessels and then add hand built components. Make cups, bowls and more! ***Camp has an additional $30 material fee included. Nature is full of fabulous creatures, large and small. Learn how to draw, model and craft many kinds of animals in this class. We’ll cover everything from fundamentals of creature anatomy to specific instruction on popular animals like horses, cats and many more. This class will include different art techniques (drawing, painting, clay and more) and the chance to work from and with natural materials like feathers, seashells, corals, bones and stones, as well as casts from actual small animals. It’s hands-on and all about animals! Multimedia creations using colors in new ways. How about a painting in black and white with one carefully chosen spot in red? How about using color combinations that “buzz” or “vibrate” like what is seen in Pop Art? What happens when you mix Day-Glo yellow with all your colors? Take on challenges to use color in new ways. Projects using mixed media will inspire you to see and use color in new ways. Fiber arts are the focus of this creative camp. Students will learn weaving, needle point, yarn work, sewing with felt and more! Multimedia creations of many fantastic or woodland creatures and their habitats. Students will draw, paint and collage a world of wild and fantastic beasts! Students will learn to wrap wire around natural stones in cool colors to create a one of a kind ring and or pendant. Awesome!